The cell. 5. Vesicular trafficking. Endocytosis. Atlas of plant and animal histology. Getting extracellular molecules into the cell is essential for cell survival. Some molecules can cross the plasma membrane, either freely or helped by membrane transporters, channels and ionic pumps. Endocytosis is a mechanism to incorporate huge amount of molecules enclosed and engulfed by the plasma membrane, that is, they enter the cell without crossing the plasma membrane. It is the opposite to exocytosis, which is the fusion of vesicles with the plasma membrane for releasing their content to the extracellular environment. Endocytosis gets extracellular molecules, and part of the plasma membrane, into the cell to forms intracellular vesicles and larger compartments. Once inside the cell, they fuse with other cell compartments, mainly endosomes. Besides assimilating of molecules targeted for degradation, endocytosis performs other functions. Together with exocytosis, it is a mechanism for renewing the plasma membrane. Molecules are removed from the plasma membrane as part of the endocytic vesicle membrane. At the same time, endocytosis balances the addition of membrane carries out by exocytosis. In this way, the plasma membrane remains quite stable and functional. There are three ways for molecules to be endocytosed: inespecifically as a soluble form or pynocytosis, specifically recognized and linked to a membrane receptor or receptor mediated endocytosis, and as part of the membrane of the endocytic vesicle or compartment (Figure 1). Figure 1. Molecules that are going to be part of the content of the vesicle may be selected by receptor recognition (specific endocytosis) or enter in solution (pinocytosis, nonspecific endocytosis). Pinocytosis is the nonspecific incorporation of soluble molecules inside vesicles or larger compartments by endocytosis. It is clear that vesicles, or other type of membrane compartments, carry molecules in solution when detached from the plasma membrane. So, all endocytic processes carry molecules by pinocytosis. However, soluble material is particularly important in a type of endocytosis known as macropinocytosis (see below), which, as its name suggest, is specialized on incorporating large amount of soluble extracellular molecules. Receptor-mediated endocytosis captures specific extracellular molecules by means of receptors located in the plasma membrane. More than 25 receptor types have been found involved in this type of endocytosis. Molecules and small particles, which may be at low concentrations in the extracellular space, are efficiently included into vesicles by this mechanism. Molecules (also known as ligands) are recognized by these receptors, and the ligand-receptor complexes gather in small plasma membrane areas where vesicles are going to be formed. 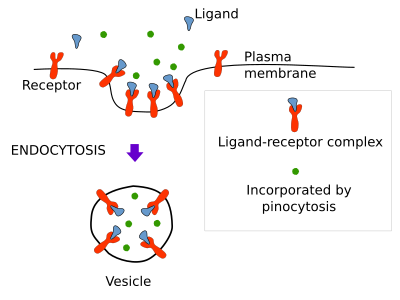 After pinching off from the plasma membrane, vesicles containing a high concentration of ligands are moved away from the plasma membrane. For example, cholesterol enters the cell by receptor-mediated endocytosis as part of low-density lipoproteins (LDL). LDL contains many cholesterol molecules surrounded by a lipid monolayer and a protein. When a cell needs cholesterol or there is a high concentration of cholesterol in the blood, many receptors for LDL are synthesized and moved to the plasma membrane. There, receptors bind LDL particles, and receptor-LDL complexes move by lateral diffusion and are eventually trapped by incipient membrane invaginations. Once formed, vesicles are targeted to endosomes, where LDL particles are released from their receptors. After that, LDL particles are moved to the lysosomes for degradation and release of cholesterol. When this pathway is damaged, for example, by lacking LDL receptors or by failures on the receptor-LDL recognition, cholesterol accumulates in the blood and may cause arteriosclerosis and heart attack. Several types of endocytosis have been described depending on the vesicle size, the material to be incorporated, and the mechanism of vesicle formation (Figure 2). Here, we will deal with the following types of endocytosis: clathrin coated vesicles, caveolae, non-coated vesicles, and macropinocytosis. Phagocytosis is being included here too, although it is a particular mechanism capturing large particles such as bacteria, viruses, and cellular fragments, which are first recognized by receptors and then surrounded by membrane. Figure 2. Types of endocytosis. Clathrin coated vesicles. This endocytic pathway is the main mechanism for incorporating integral proteins and lipids, both located in the plasma membrane, as well as extracellular molecules with a size smaller than 156 nm, including some viruses. Clathrin coated vesicles are formed in plasma membrane areas where the cytoplasmic protein clathrin is present. In fibroblasts, these areas may be up to 2 % of the total surface of the plasma membrane. Clathrin shows a three arms molecular structure, and when these proteins gather together are able to assemble into a regular pentagonal net. This organization and the way they assemble help in the membrane invagination and final closure of the vesicle. The clathrin assembling produces vesicles of about 120 nm in diameter. Clathrin, however, is not in direct contact with the plasma membrane. Other proteins, known as adaptor proteins, are intermediaries between plasma membrane and clathrin, and are also needed for clathrin assembling. Furthermore, adaptor proteins are needed for the selection of proteins which are going to be incorporated into the vesicles: transmembrane proteins as well as receptor-ligand complexes. Adaptor proteins directly bind to the cytosolic domain of transmembrane proteins, including receptors. Once vesicle is closed and moves away from the plasma membrane, the clathrin scaffold is disorganized, individual clathrin proteins are released into the cytoplasm, and vesicle is now moved to the target compartment, usually early endosomes. Free clathrin molecules are thus able to start another endocytic process. Caveolae were described in the 1950s by P. Palade after observing animal tissues at transmission electron microscopy. They are small invaginations (45-80 nm) of the plasma membrane that can be observed in most eukaryotic cells. It is supposed that most caveolae become vesicles (but see below). Caveolae are abundant in endothelial cells, muscle cells and adipocytes. Caveolae membrane contains the protein caveolin, as well as other glycosylphosphatidylinositol-linked proteins, and is enriched in sphingolipids (sphingomyelin and glycosphingolipids), and span cholesterol. The expression of caveolin in a cell is enough to form caveolae. There are around 100 to 200 caveolin molecules in one caveola and there are different types of caveolin in one caveola. Caveolae may be observed in the Golgi complex as well, so it has been suggested that vesicles formed from caveolae may work as transporter of certain molecules between plasma membrane and Golgi complex. However, most vesicles coming from the plasma membrane caveolae are fused with early endosomes. Some authors suggest that these endosomes are different from other early endosomes, and they suggest the name caveosome. Caveolae functions are not clear yet. Although an mayor role in endocytosis has been suggested, there is not strong experimental support. However, in some cell types, such as endothelial cells, muscle cells, and adipocytes, caveolae may have a more prominent role in endocytosis. Other functions may be modulating signal transduction by gathering receptors of the plasma membrane, such as tyrosine kinase receptors. They can also participate in the lipid traffic between plasma membrane and organelles. Choleric toxin, folic acid, and other molecules enter the cell by means of caveolae. They may be involved in fighting some tumors. This type of endocytosis has been proposed because endocytic vesicles are still formed when both clathrin and caveolae endocytic pathways are inhibited. Furthermore, invaginations and vesicles show a slightly different morphology. Some toxins, such as cholera toxin, enter the cell in this type of vesicles. It is largely unknown how is the mechanism of vesicle formation and how transported molecules are selected, but lipid rafts may have some role here. It is also unknown whether this endocytic pathway is regulated or not. This endocytic mechanism allows the cell to catch large amount of extracellular material. In the surface of the cell, plasma membrane, together with underlying cytoplasm, can protrude like large waves. The crests of these waves fuses together and with the flat plasma membrane forming a large membrane compartment inside the cell known as macropinosome. This mechanism relies on some molecular components that also take part in phagocytosis: actin filaments and myosin motor protein. Macropinocytosis is not just for feeding, as in amoebas, but also is useful for the recycling of plasma membrane. It is suggested that macropynocitosis facilitates the transport of large amounts of membrane from the rear of the cell to the front part during the cell movement. Furthermore, some bacteria are able to enter the cell by inducing macropinocytosis in the cell, avoiding in this way the phagocytic degradation pathway. Phagocytosis is a type of endocytosis that engulfs large particles like bacteria, cellular leftovers, and viruses. For instance, macrophages are responsible for removing pathogens like viruses and bacteria, and thousands of red blood cells every day. Protozoa, however, use phagocytosis for feeding. There are cells specialized in phagocytosis like macrophages, neutrophiles, and dendritic cells. Macrophages are resident cells in different tissues and sometimes receive particular names. For example, they are the Kuffer cells in the kidney and microglia in the brain. It is plausible that phagocytosis has evolved from a feeding mechanism in unicellular organisms to a defense role in multicellular animals. Phagocytosis starts with specific recognition of the particle by plasma membrane receptors of the macrophage. Molecules of the particle or pathogen surface, phosphatidylserine in apoptotic cells, and immunoglobulins and complement proteins of the immune system are recognized by these receptors. If enough amount of receptors are linked to their ligands, laminar and pseudopode protrusions are emitted from the cell surface. Particles are not phagocytosed if they do not have many molecules to be recognized by receptors. However, macrophages membrane harbor a diversity of receptors having different affinities for different molecules, and that work together to trigger the engulfment of the particle. Actin filaments and myosin motor proteins generate cell protrusions during phagocytosis. These cell expansions surround the particles, fuse their ridges and form an inner membrane bond membrane called phagosome, which mature and fuse with lysosomes for particle degradation. Cheng, J.P.X., Nichols, B.J. 2016 Caveolae: one function or many? Trends in cell biology. doi: 10.1016/j.tcb.2015.10.010. Mayor, S., Pagano, R.E. 2007. Pathways of clathrin-independent endocytosis. Nature reviews in molecular and cell biology. 8:603-612.